French ritualist; one of a family of scholars living at Narbonne, France (not Lunel, as Conforte and others say), who was a sufferer by the expulsion of the Jews in 1306. He emigrated to Majorca, and there, some time before 1327, composed a ritual work of great merit bearing the title "Orḥot Ḥayyim" (The Paths of Life). The first part deals chiefly with the laws concerning the daily prayers, the Sabbath, and the festivals, and was published in Florence in 1752; the second, and larger, part is now being edited by M. Schlesinger. The work is rather a compilation of Talmudic laws and discussions than an original system, and was conceived on a plan similar to Jacob ben Asher's great code, the "Arba'ah Ṭurim," which appeared soon afterward and superseded it as a ritual guide on account of its more practical character. The "Orḥot Ḥayyim," however, contains some ethical and doctrinal chapters which are not found in Jacob ben Asher's code. 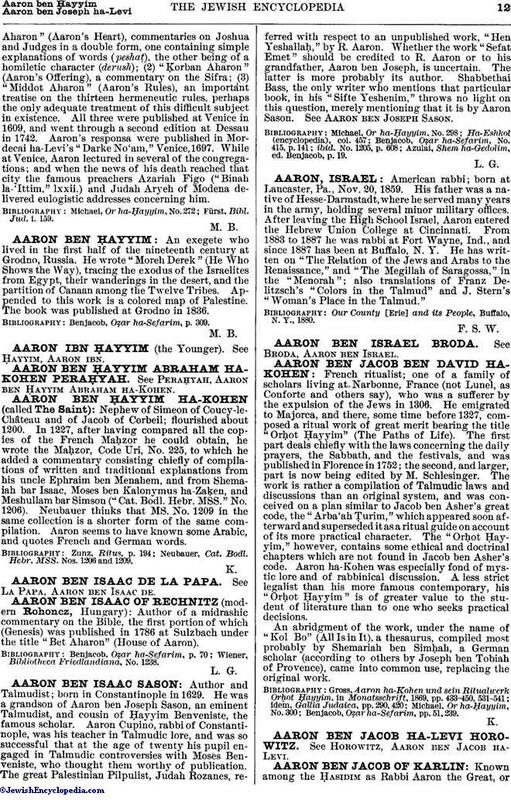 Aaron ha-Kohen was especially fond of mystic lore and of rabbinical discussion. A less strict legalist than his more famous contemporary, his "Orḥot Ḥayyim" is of greater value to the student of literature than to one who seeks practical decisions. An abridgment of the work, under the name of "Kol Bo" (All Is in It), a thesaurus, compiled most probably by Shemariah ben Simḥah, a German scholar (according to others by Joseph ben Tobiah of Provence), came into common use, replacing the original work. Benjacob, Oẓar ha-Sefarim, pp. 51, 239.